Talk about all dressed up with somewhere to go! We were recently honored to attend The Land of Nod‘s Grand Opening of their new Southern California retail location. Based inside the super-chic South Coast Plaza Shopping Center in Orange County, The Land of Nod’s newest store did not disappoint. Even the whimsically adorable window display set the perfect tone! This is a Store We Would Definitely Want to Walk Into! Having long been fans of The Land of Nod, we’ve noticed a distinct up-tick in cuteness of late. Having met their team, we can easily see where it’s coming from. Every single person we met was gracious, fun and clearly excellent at their line of work. A fun side note, if you’re like us and enjoy getting to know the faces behind your purchases, check out the The Land of Nod blog and search for “Who’s that Noddie” to meet their crew. It goes without saying that we’re not the only interior design professionals who are crushing on The Land of Nod brand. Industry household names, such as Joy D. Cho of Oh Joy! and Emily Henderson of HGTV fame, were in attendance too. As there are relatively few brick-and-mortar The Land of Nod locations, here are some fun shots of the store for you. We’re Thinking of Borrowing this Idea! This is Truly a Happy Place! Before we forget, The Land of Nod wanted us to tell you that they want to design a room for you! Click here for details and good luck! Readers’ Favorite: Luke DIGS Being 2 – A Construction Party! These photos make me want to visit the store! 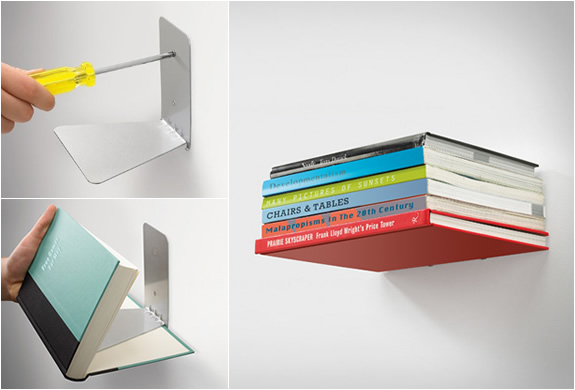 I love the Children’s Classics hardbound books being made into a floating shelf! Are those really books or it’s just the design? the vignettes in the store! How do these floating shelves work? This is how they work, Romina. There’s a tiny hook that holds the bottom flap or cover and keeps it from dangling.